, he would've been anxious to journey into film. 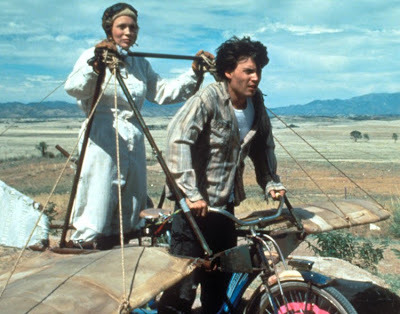 And likewise, following Edward Scissorhands, this film's eccentric approach that segued nicely Depp style into his next roles in Benny and Joon and What's Eating Gilbert Grape, thereby helping establish the “Johnny Depp type” in both script and character that he's responded to for almost two decades. Yet while Depp is as magnetic as ever and manages to somehow keep us invested in his character, even when the young man he's playing finds himself in the most alarming of situations, the rest of the movie makes about as much sense as his character's opening dream about an Eskimo family. After the dream, cousin Vincent Gallo gets Depp drunk enough to drive him from New York to Arizona to take part in the wedding of his uncle (Jerry Lewis) to a much younger, overly emotional trophy wife (Her Alibi star Paulina Porizkova). 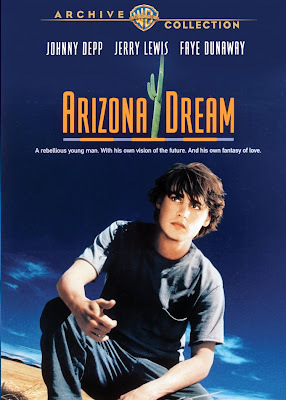 Once in the desert, Depp's character Axel finds it's impossible to say no to the man who was his childhood hero, despite the fact that his uncle accidentally killed the young man's parents. Promising to try and make a go of selling Cadillacs for a week at his uncle's dealership-- while Axel's sales skills are abysmal, he discovers that he's the one who's in the market for something new when he falls for the older, seductive Faye Dunaway. Trying his best to ignore the morbid ramblings of her stepdaughter (Lili Taylor), Depp embarks on an affair with Dunaway until he realizes that the basket-case Taylor may be far more genuine than the foxy but pretentious lady of the house. Dubiously described as a “comic fantasy,” there's not a whole lot that's comical about this largely melancholic fantasy in which suicide is not just a plot point but a recurring theme and absolutely none of the characters feel as though they're either real or individuals that you'd want to spend any time with on film or in real life. One of the biggest turkeys of Depp's career, the film that has never been officially released in the U.S. on DVD until 2010 is the the type of movie that may have entertained the director he played in the eponymous Ed Wood. And while it's safe to say that Depp's die hard fans won't be dissuaded into skipping it for the opportunity to see him back in his early '90s era, the rest are better off watching Benny and Joon, Gilbert Grape, and Scissorhands again instead of gambling on this work that's anything but a Dream -- Arizona or otherwise.